ExSQUZ Me is a coöperation between AIR and the Amsterdam agency SQUZ. For this first event they brought out an excentric icon of underground dance music, DJ HELL. This man has been mixing music differing from punk, new wave, pop and disco, all the way into contemporary techno and electro. He’ll be supported by local talents Roger Gerressen and Jasper Wolff. Sounds juicy? We can help you out, so comment on this post on Facebook and tell us why you want to get our 2×2 tickets for this event. 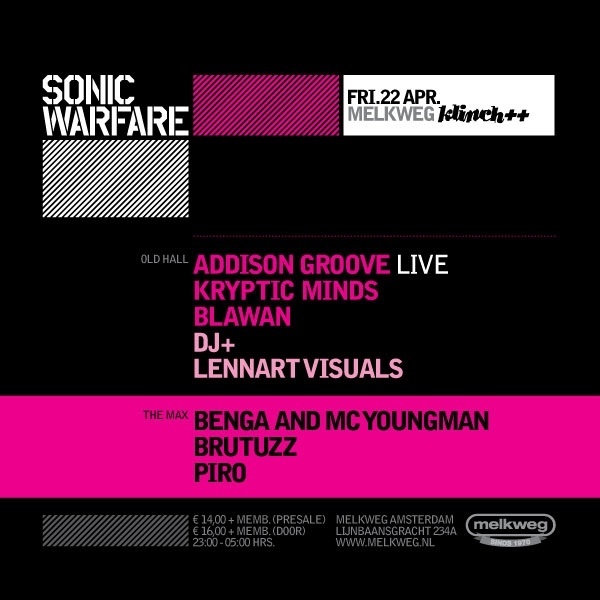 Sonic Warfare and dubstep scene high roller Benga are taking over Leidseplein’s Melkweg this friday. Providing us futuristic dub music in both area’s within the venue, the big area brings Benga, Brutuzz and Piro. The Warfare area will be filled with beats from Addison Groove, Kryptic Minds, Blawan and local hero DJ+. Reminder: the Warfare line-up will take over Red Light Radio this friday from 19.00 to 21.00. Sounds even juicier? We’re offering some tickets! Comment on this post on Facebook and tell us why you can’t miss out on this event. If you’re really getting into the Easter-vibe, I cannot think of a better place to start celebrating this long weekend! Featuring local hero Olivier Weiter and a list of DJ’s mentioned in the long flyer beneath, including the well-named Anna Bohle. Expect a whole bunch of entertaining experiences such as a hugging workshop, chicken stroking, chocolate searches and more! Man oh man, does this party feature an all-star line-up from the infamous German Diynamic label or what. To celebrate their 5th anniversary, Solomun, Kollektiv Turmstrasse (live), Stimming (live), H.O.S.H., Uner and one of my recent favourites David August are bound to hit the stages. See you up front. Since monday is probably still a holiday for most of you, here’s another one. I’m not gonna elaborate too much on this one, either you know him from his genius baile-hip-hop-eclectro remixing skills he displayed over the past few years, or from the recent BlackBerry ad. Might seem like somewhat of a sell-out move, but music is music and great DJ’s can still be great. Allow me to let the small Vice docu beneath do the talking. Finally, our friends of Plak are throwing a proper sunday rave at De Kring & ClubUp. Names like Terry Toner, Reiss and Immer (live) amongst others will give you a blast ’till 7 in the morning. Expect a silent disco and lots of other weird stuff to add to the experience. What the heck, let’s throw in some tickets for this one to end the weekend with! You know the drill, comment on this post on Facebook and tell us why you should be attending this event. Sleep.